Our first week in Southern Utah was spent camped in Long Canyon at the northern end of the Burr Trail. Our camp was about ten miles from Boulder, Utah. There are a few places down in the canyon to camp but not many. There are a few more up on top just before you drop into Long Canyon and there is a small campground at Deer Creek. This campground does not allow trailers though and with only six sites, it is usually full. Our campsite was at the mouth of a canyon called, The Gulch, and there was room for three to four camps there. 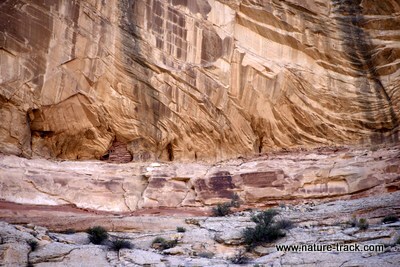 The best site is just after you drop into the canyon but it seems to always be occupied. We were happy with our site as temperatures were on the cool side and there was plenty of sun to warm the trailer (that would have been great if we had ever been there in the light of day but that never happened) and to keep the battery charged with the solar panel. That is our trailer center left, just in the shade left of the green triangle. Our first adventure was to drive south on the Burr Trail. We took a good side road toward Wolverine Canyon and checked out several trailheads and abandoned mines (cemented closed) along the way. 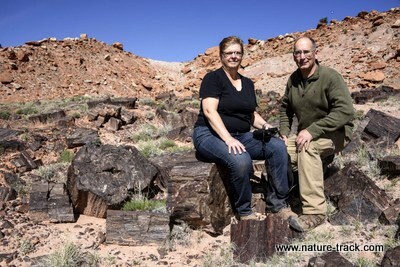 At Wolverine Canyon, we took a hike down to a petrified forest. This was actually pretty cool despite the fact that this petrified wood isn’t nearly as pretty as that found in the Petrified Forest National Park in Arizona. What I found most amazing was that this tropical forest was being slowly uncovered by erosion at the base of a hill towering several hundred feet above it. So, it existed so long ago that it lived, died and was buried by hundreds of feet of silt and soil and then, AND THEN, all that soil compacted into rock and THEN eroded away to uncover the forest once again! Absolutely mindblowing. 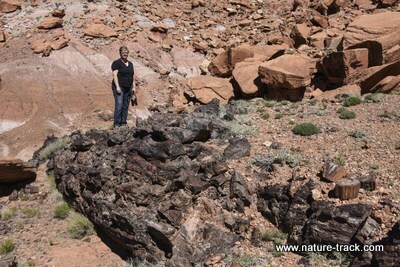 Cathy stands on top of a fallen and petrified log. Weathering has just begun to expose this log which was buried under over 100 feet of rock. We hiked another mile downstream, ate lunch and then headed to the truck. 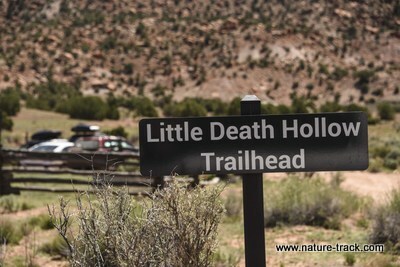 From there we explored the trailhead to Little Death Hollow, one of the most popular trails in the Monument. From the description in the guidebook, this trail has just about everything and needs to get on my short list of things to do before I am too old. We eventually looped back to the main Wolverine Road and back to Burr Trail. We stopped at the top of Long Canyon and took a few photographs—this is one of my favorite places for sunrise photography—and I wanted to see how it looked at sunset. Sunset was nice, but mornings are still my preference. Top of Long Canyon in the Afternoon. The lead photo at the top is the same location at sunrise. 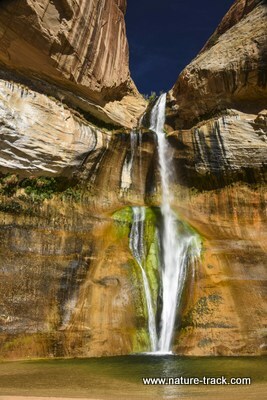 The biggest item on our must do list was to hike into Lower Calf Creek Falls. Last year I sprained my ankle before we had the chance to do this hike and we were pretty bummed out. 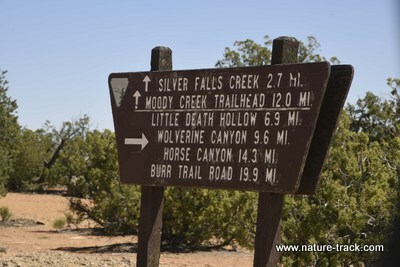 The trailhead is only about 10 miles or less from Boulder, heading toward Escalante across the Hogsback highway. We started early, about 0700, because we wanted to beat the heat, hoped to see more birds and we wanted to beat the crowds that were sure to come. There were a few other hikers on the trail but we mostly had it to ourselves. The trail itself isn’t difficult at all. It does gain in elevation and there are a few hills but not much of a concern even to a couple of out of shape people like us. It is three miles though and in the afternoon when we returned we found that most all of the return trip was in the sun. Lower Calf Creek Falls is a beautiful spot, well worth the effort to get there. The falls is a ribbon of water falling perhaps 100 feet into a beautiful pool. 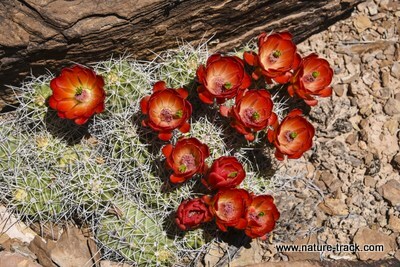 The red rock is accented with green and blue algae, making a striking contrast. 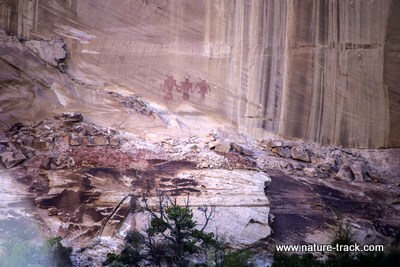 By noon, the trail lived up to its reputation as the most popular day hike in the Monument. There were dozens of people at the falls when we left and we encountered perhaps another 50 coming up as we were going down. Our early start was a good idea. Along the trail are 12 numbered stakes, with the first being near the beginning and the last being at the falls. If you will pick up the free brochure at the trailhead registration, you will be able to read about what each number represents including some pictoglyphs and a Fremont Indian granary on the opposite cliffs. It is possible that you can spot them anyway, but they aren’t obvious and the numbers and brochure really help. We would not have seen this granary (the darker spot just left of center), perhaps 800 years old, on the other side of the canyon if not for the brochure. These pictoglyphs were a little easier to see if you knew to look for them. The trail guide was very helpful. 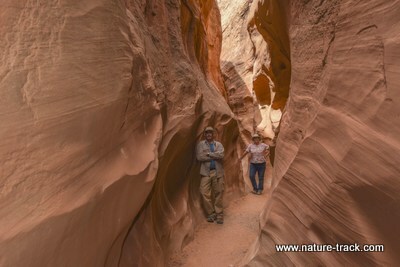 Our other priority for the Monument was to get into a slot canyon or two. We have seen photos of slot canyons but have never been in one. After a lot of research, we decided to try Peekaboo Canyon off the Dry Fork trailhead. 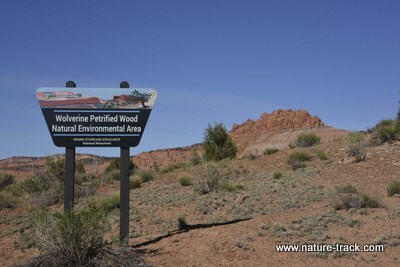 This trailhead is about 26 miles down the Hole in the Rock Road about eight miles southeast of Escalante. After the turn-off the road is rough, but it is passable. If it is wet though, that might not be the case. In that event, park and walk the last mile. The trail is a little confusing right off the trailhead. If you drop down onto the angled shelf to the left and then follow the cairns, you will quickly find yourself at the bottom. 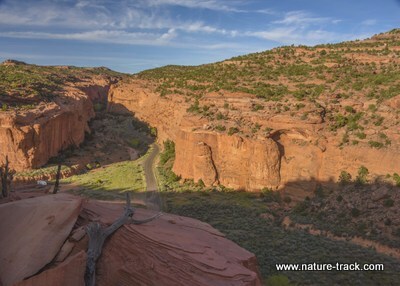 To the left is an obvious slot, the Dry Fork of Coyote Gulch. Peekaboo is to the right about 100 yards. It is very easy to miss this slot because it doesn’t come down to the ravine floor. You have to scramble up to the mouth and it is a scramble. I wasn’t sure that I could make it but with Cathy’s encouragement, I did. Cathy, on the other hand, chose to hike to the top of the canyon to see if she could get in from up there. 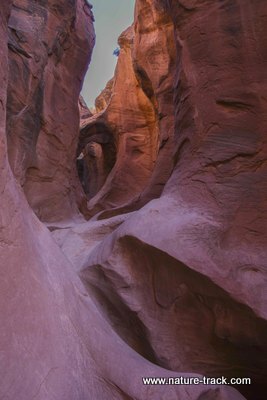 This was a real slot canyon, just like you might see in the guidebooks or a coffee table book about Southern Utah. It has tiny arches, gracefully sculpted walls, and places where there are waterfalls during storms. It was a fun scramble and I nearly went berserk taking photos. It was also a busy place and it was sometimes hard to get a photo without people in it. Cathy and I finally met up near the top of the canyon. She had come down a little way but wisely chose the better part of valor and waited for me to appear. We walked back down along the top of the canyon for a ways and then she showed me the way back. In retrospect I wish we had gone the extra half mile over to the Spooky Canyon and returned that way. People who did it said it was better than Peekaboo (deeper), but also said it was a tight fit where even daypacks would be a hindrance. 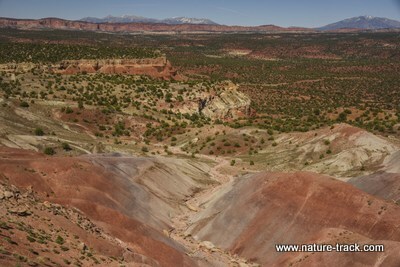 We went into the Dry Fork of Coyote Gulch and walked up that for perhaps a quarter mile. It continued on, but was quickly getting more shallow. It was a pretty canyon though and well worth hiking. Dry Fork of Coyote Canyon isn't very long but it is worth hiking. 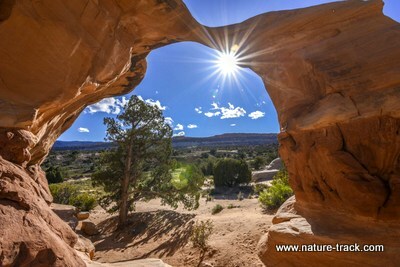 On our way out, we spent the late afternoon and evening hours at Devil’s Garden, a wonderful place of arches, hoodoos and other shapes. The great thing is that it is just off the main road so it is easily accessible. Cathy was kind enough to sit and enjoy her book while I wandered for several hours photographing everything from every angle I could think of. It was such a target-rich environment that it was truly challenging to figure out where to point my camera. 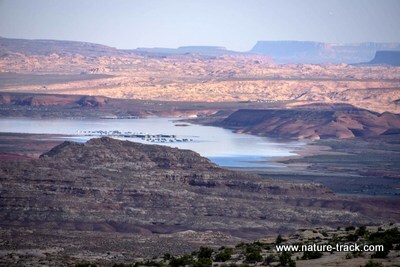 As I mention in the blog on Capitol Reef, we took an overnight trip to Bullfrog Basin to see my brother, Bruce and sons, Jacob and Ben and nephew Shane who were fishing at the lake. We took the Burr Trail and found it to be a pleasant 2.5-hour drive from camp to the Basin. In places, the wildflowers were terrific and despite a somber overcast, it was beautiful. Bullfrog Basin from the Burr Trail. We hoped to dry camp but it was hard to find a place without livestock and so we finally stayed in the campground. As I was walking to the restroom in the morning, I bumped into a friend, Marc Arms, from work. In what must be one of the world’s great coincidences, he and several other old Fish and Game buddies, Mark Carson and George Fischer, were literally camped next to us. As it turned out, we could have taken the road to Stratton Creek which leaves the main road just before it drops into the bay. There is primitive camping there with a few outhouses. 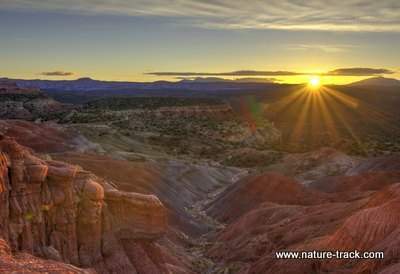 It is hard to beat Grand Staircase-Escalante National Monument and the surrounding area. From high mountain lakes and aspen and pine forests to desert slot canyons and grand reservoirs, rivers and waterfalls and crazy rock formations, this place has it all.